This article is about the film. For other uses, see Little Nicky (disambiguation). Little Nicky is a 2000 American fantasy comedy film directed by Steven Brill. It stars Adam Sandler as Nicky, one of Satan's three sons as he attempts to save his father and prevent his brothers from taking over Earth. The film was a financial failure and received negative reviews from critics. Having been the Prince of Darkness for ten thousand years, the Devil assembles his sons to decide which of them will succeed him; he tells them that they are not ready yet, having decided to keep his throne. Angered by this decision, Adrian and Cassius go to Earth to create a new Hell by possessing religious and political leaders in New York City. As they leave, they freeze the entrance to Hell, preventing more souls from entering and causing Satan's body to begin decomposing. To stop Adrian and Cassius, Satan sends Nicky to Earth with a silver flask that traps whoever drinks from it inside. At first, Nicky has trouble staying alive on Earth. He is killed several times, landing in Hell and returning to New York each time. While learning how to eat and sleep, he meets a talking bulldog named Mr. Beefy, rents an apartment with an actor named Todd, and falls in love with a design student named Valerie. Nicky's first encounter with his brothers occurs when Adrian sees him with Valerie, takes mental control of his body, and makes him scare her away. Then Nicky sees Cassius on television, possessing the referee of a Globetrotters game. When he goes to the court and tricks Cassius into the flask, Satanist metalheads John and Peter are so thrilled with his performance that they become his devoted fans. That evening, Nicky tries to apologize to Valerie. The meeting goes badly at first, but she accepts him after he explains who he is and why he is on Earth. The next day, Adrian possesses the Chief of the NYPD and accuses Nicky of mass murder. Not knowing what to do, Nicky has Todd kill him so he can go back to Hell and ask his father for advice, but his father has trouble hearing because his ears have fallen off, and his assistants are in a panic because the midnight deadline to capture Adrian and Cassius is only hours away. Back on Earth again, Nicky and his friends devise a plan to capture Adrian in a subway station, but Adrian discovers their trick. In the ensuing fight, Adrian grabs Valerie and dives onto the track as a train approaches, but Nicky throws her out of the way, leaving himself and Adrian to be killed by the train. Arriving in Hell just minutes before midnight, Adrian begins the process of taking over Hell by pushing what remains of his father aside and sitting on the throne, rising to Central Park, and starting a riotous party. Meanwhile, Nicky wakes up in Heaven as a reward for sacrificing himself and meets his mother, an angel who tells him that he can defeat Adrian with the Inner Light that he inherited from her. After she gives him a mysterious orb, he goes to Central Park. Adrian appears to win a battle by locking Nicky in the flask and turning himself into a bat, but Nicky escapes from the flask. When he shatters the orb, Ozzy Osbourne appears, bites Adrian's head off, and spits it into the flask. With his brothers captured, Nicky is ready to save his father. After he sins to make sure he goes to Hell, he and Valerie express their love for each other and she kills him. In Hell, Satan regains his body and recommends that Nicky go back to Earth. The film ends a year later, when Nicky and Valerie live in New York with their infant son. It opened at #2 at the North American box office making $16 million USD in its opening weekend, behind Charlie's Angels, which was on its second consecutive week at the top spot. The film went on to earn $39.5 million domestically and another $18.8 million worldwide, bringing the total to $58.3 million. 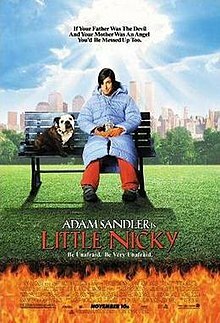 Based on 115 reviews collected by the film review aggregator Rotten Tomatoes, only 22% of critics gave Little Nicky a positive review. The site's consensus states [that] "Despite the presence of a large, talented cast, the jokes in Little Nicky are dumb, tasteless, and not that funny, and Adam Sandler's character is grating to watch." Comedian and former Mystery Science Theater 3000 host Michael J. Nelson named the film the worst comedy ever made. Roger Ebert had some positive comments for the feature, describing Little Nicky as "the best Sandler movie to date," while at the same time lamenting Sandler's lack of finesse. The film was nominated for five awards at the 21st Golden Raspberry Awards, including Worst Picture, Worst Actor (Adam Sandler), Worst Supporting Actress (Patricia Arquette), Worst Director and Worst Screenplay. It lost in all categories to Battlefield Earth starring John Travolta. Despite its negative reception the film has received a cult following over the years. It also has a 56% audience approval rating on Rotten Tomatoes. Little Nicky was released on DVD and VHS on April 24, 2001. The DVD includes two audio commentaries and plenty of deleted scenes. There is yet to be a blu-ray release of the film. A Game Boy Color game was released based on the film shortly after its release. ^ "Little Nicky (2000)". Rotten Tomatoes. Retrieved 2016-04-03. ^ Nelson, Michael J (2007-03-06). "Inoperable Humor: The 5 Worst Comedies of All Time". Cracked.com. Retrieved 2016-04-03. ^ Ebert, Roger (2000-11-10). "Little Nicky Movie Review & Film Summary (2000) | Roger Ebert". Rogerebert.suntimes.com. Retrieved 2016-04-03. ^ a b AllMusic Review by Heather Phares (2000-10-31). "Little Nicky - Original Soundtrack | Songs, Reviews, Credits". AllMusic. Retrieved 2016-04-03.